1 Overcast with St, Sc + (s)light intermittent drizzle till 1800. After 2100 breaks & from 2200 on fog came in but the sky remained clear. Top Tmax: Koksijde 10,9°C, Zaventem had 9,9°C. 2 Fog lifted around 0500 when a broken Sc layer came in, lasting whole day long. Top Tmax: Ghent 10,8°C, Zaventem had 9,7°C. 3 Clearing skies from midnight on, Tmin reached -0,7°C. Sunny day with a bit Ci. Top Tmax: Kleine Brogel 11,8°C, Zaventem had 10,1°C. 4 Tmin reached -1,4°C after freezing fog entered from 0400 lasting till 1100. Low cloudiness cleared off leaving lots of thin Cirrus. Top Tmax: Charleroi 9,4°C, Zaventem had 7,8°C. 5 Just after midnight freezing fog, but with clear skies, disappearing after 0200. Tmin -2,2°C. Incoming St from 0600 on, lasting till 1500 when Sc invaded. (S)light intermittent rain-drizzle between 1800-2300. Top Tmax: Ostend 8,4°C, Zaventem had 4,3°C. 6 Clearing skies after midnight, with only a few Cu Sc clouds, Tmin reached -0,7°C. During afternoon increasing Sc with first snow flakes around 1630, lasting till 2200. Sometimes moderate intensity with very big flakes. Total around 2 cm of wet snow. Afterwards remaining St overcast & very misty. Top Tmax: Deurne 6,4°C, Zaventem had 4,3°C. Some snow heights at midnight: Beauvechain 6 cm, Zaventem 5 cm, Liège 2 cm, Charleroi & Kleine Brogel 1 cm. Check also pictorial report. 7 Turning foggy after midnight lasting till 0900, afterwards misty & St overcast till 1500, then clearing skies with lots of Ci remaining. After 1900 again St overcast followed by freezing fog. Tmin in garden was -0,9°C. Top Tmax: Koksijde 4,7°C, Zaventem had 1,0°C. Snow in garden was by the evening for 90 % gone. This morning, these snow covers were measured: Elsenborn 5 cm, St-Hubert 3 cm, Spa 2 cm. 8 Fog disappeared from 0200 on, remaining St overcast & misty. Tmin reached -3,3°C. From 0800 light to moderate falls of snow lasting till 1100. Cover of around 5 cm in garden. Afterwards breaks and with T >0°C a very fast melting process leaving no trail by the evening. During afternoon & evening a couple of light rain showers. Max snow heights before melting (around noon): Kleine Brogel 7 cm, Elsenborn & Zaventem 6 cm, Koksijde 5 cm, Beauvechain & Spa 4 cm, Deurne, Ostend, Charleroi, Florennes & St -Hubert 3 cm, Liège 1 cm. Top Tmax: Koksijde 7,8°C, Zaventem had 6,3°C. Check also pictorial report. 9 A couple of rain showers during early night. Afterwards partly cloudy to cloudy with a few Cu Sc but lots of Ci. Top Tmax: Charleroi 8,2°C, Zaventem had 7,2°C. Snowcover of 2 cm at Elsenborn disappeared during the day. 10 Very cloudy to overcast with tempo intermittent light rain 1100-1600 = 2 mm. Top Tmax: Koksijde 9,9°C, Zaventem 8,2°C. 11 Light rain 0500-1100, later a couple of rain showers, total was 8 mm. Clearing skies after sunset. Top Tmax: Kleine Brogel 11,3°C, Zaventem had 10,6°C. 12 Light rain 0130-0800, during the day a few short breaks but also a couple of rain showers. Total rain = 7 mm. Top Tmax: Kleine Brogel 12,2°C, Zaventem had 11,0°C. Top gust: Ostend 41KT. 13 Last showers till 0400 = 2 mm. Very cloudy with Sc, towards sunset Cs As. Top Tmax: Deurne 10,1°C, Zaventem had 10,0°C. 14 Light intermittent rain & drizzle between 0200-2300 giving 8 mm. Top Tmax: Koksijde 8,4°C, Zaventem had 7,5°C. 15 Tmin garden 1,3°C & hoar frost. Sunny with some Cirrus from afternoon on. Top Tmax: Kleine Brogel 11,9 C, Zaventem 11,4°C. 16 Tmin garden 0,6°C with ice on car windows. Nice sunset, followed by a quite sunny day but with lots of Ci Cs, late afternoon also As with mamma & virga (resembling to an high altitude Cb). Top Tmax: Ukkel 16,2°C, Ghent 15,9°C, Semmerzake & Charleroi 15,5°C, Zaventem had 15,2°C. 17 Tmin garden 1,6°C. Cloudy to very cloudy with Ci, Cs & As. 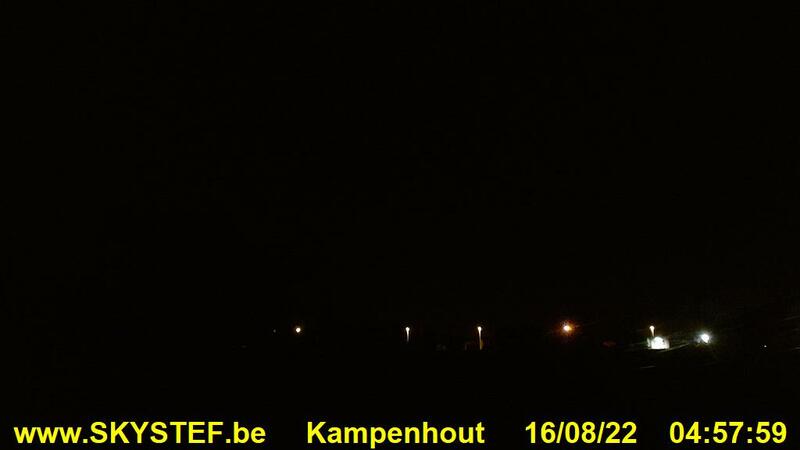 Top Tmax: Ukkel & Deurne 14,2°C, Zaventem had 12,8°C. 18 Invading stratus from 0400 on, lifting to Sc during forenoon, with a few small gaps around noon. Again descending to Stratus after 2200. Top Tmax: Deirne 9,1°C, Zaventem had 8,4°C. 19 Very cloudy with St & misty till noon, than clouds lifted to Sc, tempo some large breaks with Cs remaining but still hazy. After 1700 again broken Sc, after 2000 descending to St. Top Tmax: Liège 9,9°C, Zaventem 8,8°C. 20 Lifting again to Sc & disappearing after 0200, leaving Ac, Ci & Cs. Top Tmax: Liège,Diest & Deurne 15,2°C, Zaventem 14,5°C. 21 Becoming Ns overcast with intermittent light rain & drizzle 0700-1500. Around 1615 a shower accompanied by small hail and a couple of thunders. Total rain was 3 mm. Afterwards clearing skies with Ci remaining. Top Tmax: Kleine Brogel 12,4°C, Zaventem had 10,1°C. Today, during afternoon, some weak thunderstorms over extreme east of Oost-Vlaanderen, and furthermore over isolated spots of Vlaams-Brabant, Antwerp, West-Vlaanderen & Hainaut. 22 Cloudy with lots of Ci, Cs & some Ac, in afternoon tempo few Cu. Top Tmax: Ghent 13,2°C, Zaventem had 11,4°C. 23 Sc, Cu cloudy with light rain showers around 1100 & 1700. Top Tmax: Kleine Brogel 14,4°C, Zaventem had 12,6°C. 24 Very cloudy with Tcu, Cu & Sc and showery rain 0700-1500 giving 3 mm. Top Tmax: Kleine Brogel 12,8°C, Zaventem 10,9°C. 25 Very cloudy to overcast with (light) rain 0400-0800 & 1100-1900 = 12 mm. Top Tmax: Kleine Brogel 10,4°C, Zaventem 7,9°C. 26 Overcast with (light showery) rain 0100-0400 & 0800-1930 = 18 mm. Top Tmax: Kleine Brogel 9,0°C, Zaventem 7,7°C. 27 During morning becoming overcast followed by (light) rain & drizzle from 1000 on = 8 mm. Breaks from 2300 on. Top Tmax: Koksijde 11,6°C, Zaventem had 10,6°C. Top gust: Ostend 41KT. 28 Cloudy with between 0800-2100 a couple of rain showers giving 4 mm. Top Tmax: Chièvres 12,8°C, Zaventem had 11,8°C. Top gust, stations with >40KT: Ostend 47KT, Koksijde & Liège 45KT, Zaventem, Beitem & Ernage 43KT, Deurne 42KT, Chièvres & Semmerzake 41KT. Today all provinces had some isolated thunderstorms, over province of Antwerp they even turned out to be rather heavy with hailstones of around 1 cm. Radar pictures showed signatures of a couple supercells and bow echo's.